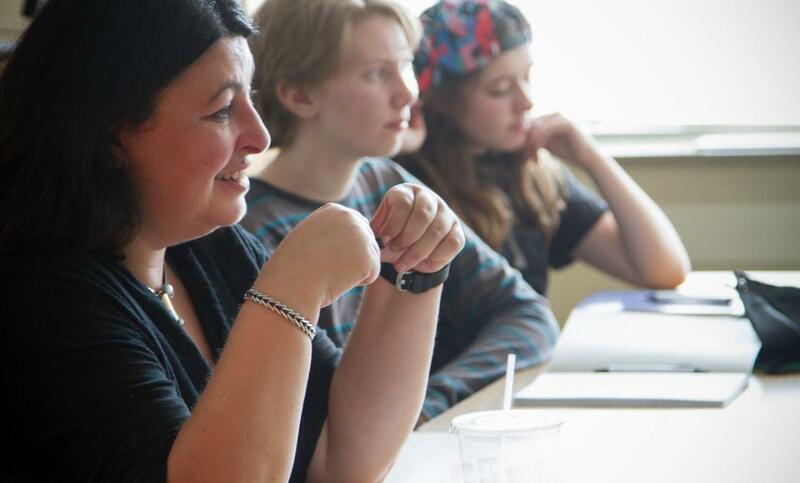 At the IYWP’s 2016 Junior High Writing Conference, students had the opportunity to take a fiction workshop with nationally recognized YA novelist Michelle Falkoff. Community Foundation of Johnson County, Hills Bank, ACT, HyVee, and the Iowa Arts Council. Join the IYWP on the University of Iowa campus for a day of creative writing and empowerment! During the day, you’ll enjoy workshops from nationally recognized writers on Fantasy & Science Fiction, Spoken Word Poetry, Novel Writing, Personal Writing and more. After workshops, you’ll be treated to lunch at a food court-style cafeteria in Burge Hall. The day finishes up with a fun Open Mic, where you can choose to share your new work with a supportive audience or cheer on your fellow students. Finally, in the weeks following the conference, you can become a published author by submitting writing you started that day to be included in the Conference Anthology. With exercises to get you started and also some talk about poems already written (some quite new and some several centuries old), Stephanie will help show how nonhuman animals, talking plants, and speaking objects can become emotionally rich and aesthetically effective ways to explore who you are, who you have been, who you are not, and who you might be. If there's time we may also look at how poets adopt and speak for already existing fictional characters, from ancient myths to modern science fictional speakers or pop stars. Stephanie (also Stephen and Steph) Burt is the author of three poetry collections, Belmont, Parallel Play, and Popular Music, and several collections of critical works. Her essay collection Close Calls with Nonsense was a finalist for the National Book Critics Circle Award. Her other works include Advice from the Lights; The Poem is You: 60 Contemporary American Poems and How to Read Them; The Art of the Sonnet; Something Understood: Essays and Poetry for Helen Vendler; The Forms of Youth: Adolescence and 20th Century Poetry; Parallel Play: Poems; Randall Jarrell on W. H. Auden; and Randall Jarrell and His Age. Her writing has appeared in the New York Times Book Review, the London Review of Books, the Times Literary Supplement, The Believer, and the Boston Review. Place: Beadology (back room), 220 E. Washington St. Outstanding spoken word artist and musician Moor Mother empowers teens in a workshop on spoken word and making your voice heard. If you want to be inspired to tell your story in new ways, join us for this extraordinary opportunity to work with an electrifying performer. Don't miss this rare opportunity to meet and write with Dina Nayeri, award-winning novelist and essayist. In a special workshop just for high school students, Nayeri will invite you to explore in your own writing some of the themes that animate her work, including the refugee experience in a time of global immigration. Please join the IYWP and UNESCO City of Literature to be inspired by one of today's most internationally acclaimed authors. Dina Nayeri is the author of the acclaimed essay “The Ungrateful Refugee,” published in The Guardian as a Long Read in 2017, and a forthcoming book of narrative nonfiction on the refugee life. Winner of a National Endowment for the Arts Grant (2015), the O. Henry Prize (2015), Best American Short Stories (2018), and fellowships from the McDowell Colony, Bogliasco Foundation, Yaddo, and several other artist residencies, her work is published in over 20 countries and has been recognized by Granta New Voices, Barnes and Noble Discover Great New Writers, and others. A finalist for the 2017 Rome Prize, her stories and essays have been published by The New York Times, NYT Magazine, NYTBR, The Guardian, Los Angeles Times, New Yorker, Granta, Wall Street Journal, The Atlantic, Vice, Guernica, Electric Literature, Conjunctions, Marie Claire, and elsewhere. Her debut novel, A Teaspoon of Earth and Sea, was released in 2013 by Riverhead Books (Penguin) and translated to 14 foreign languages. She holds a BA from Princeton, an MBA and Master of Education, both from Harvard, and an MFA from the Iowa Writers’ Workshop, where she was a Truman Capote Fellow and Teaching Writing Fellow. Dina’s second novel, Refuge, was released in 2017 and was a New York Times editor’s choice. She lives in London. Calling all teens! Join the IYWP this weekend for a rare opportunity to use art as inspiration and to get PUBLISHED doing it! Writer and artist Jenny Colville has gathered an eclectic collection of art from local luminaries--paintings, photos, sculptures, etchings, and more. Your mission in this weekend workshop, under Jenny's steady guidance, will be to write (anything! a poem! a story! a ditty! a song!) in response to one or more of the pieces of art you see. The best part: ALL work created at this workshop will get published online in Prompt Press. Many of your pieces will also be selected to hang beside the art that inspired them at the IYWP's ART SPARKS gallery show at Goosetown Cafe on September 25th. All are welcome! Mission Creek Festival and the Iowa Youth Writing Project present an Erasure Poetry Workshop with author and poet Hanif Willis-Abdurraqib. Hanif will work with participants to craft imaginative and surprising erasure poems, largely by taking lyrics from popular music and erasing them to create original works. Hanif Abdurraqib is a poet, writer, and cultural critic from Columbus, Ohio. His essays and music criticism have been published in The FADER, Pitchfork, The New Yorker, and The New York Times. With Big Lucks, Hanif released a limited edition chapbook, Vintage Sadness, in Summer 2017. He is a Callaloo Creative Writing Fellow and previously worked for MTV News, where he wrote about the intersections of music, culture, and identity. Hanif also wrote the 2016 live shows: MTV Video Music Awards and VH1’s Unsilent Night. His first full length collection, The Crown Ain't Worth Much, was one of 2016s best-selling poetry books and was named a finalist for the Eric Hoffer Book prize. Hanif's debut collection of essays titled, They Can't Kill Us Until They Kill Us, was published November of 2017 via Two Dollar Radio. He is a member of the poetry collective Echo Hotel with poet/essayist Eve L. Ewing. The words we use to express our feelings and our minds matter. What does your voice have to say? If you have an interest in mental health, and if you like to express yourself creatively, come join the Iowa Youth Writing Project for “Writing Our Minds,” a four-session workshop exploring mental health through creative expression in a safe and vibrant space. Every participant will have the choice to publish one piece of creative work in our very own workshop book. Together, we’ll write, collage, and re-define the words and stories we use to have conversations about our emotions and minds. We’ll learn about how people in the past told their mental health stories as we plan for a future where writing about mental health is celebrated by all. Notebooks and writing materials will be provided, as will snacks. By the end of this workshop, you will have a better understanding of the history your own story comes from, and you’ll leave the workshop with creative prompts for your own personal use. All participants will take a copy of the workshop book home. Upon completion of these workshops, you’ll be invited to share your work at a public reading event hosted by the Iowa Youth Writing Project. Registration for the 2018 Junior High Writing Conference is now closed. If we missed you this year, please check back in January 2019 to register for next year's conference! Cost: Free to all participants. Materials provided. Featuring panelists Kingsley Botchway, Rossina Liu, and Jason Daniel-Ulloa. Are you looking for a place to discuss and write about real-world issues? A place where your voice will be taken seriously, no matter what your perspective? Join the IYWP for the first in a series of innovative workshops designed to put teens at the helm of discussing current issues in social justice. This first discussion, centered on race, will feature an open forum, a series of reflective writing exercises, and a q&a session with a diversely talented panel of local activists of color. Ready to use your writing to make a difference? Are you a passionate comics artist? Do you want to meet and work with other dedicated comics artists? Then this twice-monthly workshop is for you. In these six sessions, you’ll work closely with professional artists to make and print 2-3 of your own 12-page mini-comics. Along the way, as you experiment with craft elements like story layout, character development, and cover design, you’ll also gain experience in pricing and promoting your work. Sessions will culminate in your attendance at ICE CREAM, the third annual Iowa City Expo for Comics & Real Eclectic Alternative Media, on Saturday, April 7, where you’ll display and sell your completed comics! To read more about ICE CREAM, check out this Little Village article about the very first Expo in 2016. This workshop is a special partnership between the Iowa City Press Coop and the IYWP. High school students can register now for an extraordinary workshop on LGBT identity with novelist and essayist Alexander Chee. In the first 30 minutes, the Iowa Youth Writing Project will invite participants to write from a prompt about identity, as inspired by one of Chee’s essays. Chee will then join the group in the remaining hour for a question and answer session in which students can share their work and interact with the author. Don't miss this incredible opportunity! Co-sponsored by the Iowa City UNESCO City of Literature and the Iowa Youth Writing Project. Veterans have amazing stories to share. Find out for yourself by spending a Saturday writing with them! Five Vietnam veterans from the writing group at the East Moline Vet Center will be joining us in Iowa City for this very special opportunity. We’ll kick off the day with a collaborative writing exercise for students and vets, and then we will break into small groups to give students the opportunity to interview the veterans, and vice versa. Get excited – these vets are master storytellers! Have you ever seen a bully in action? Have you ever wanted to step up and do something about it? “Stand Up, Speak Out” will give you the tools to be a bully buster! We’ll write reflectively about our experience with bullies, discuss safe and effective techniques for stopping bullying and hate speech, and take matters into our own hands by writing letters to school and government officials. If you’re interested in creating positive change in your school and community, this workshop is for you. Place: UAY Main Office, 1700 S First Ave, Suite 14, Iowa City. In the Eastdale Plaza. Are you looking for a safe and vibrant space in which to explore and tell your story? A place where you’ll be listened to and heard? Join Broadway actor, writer, and social activist James Lecesne & songwriter and performer Ryan Amador for this two-day workshop for LGBTQ and allied high school students. As part of a national tour, James and Ryan are bringing The Future Perfect Project to Iowa City with the hope of providing you with storytelling and songwriting techniques to express your unique vision. Friday Writing Club with the IYWP! If you're in grades 3-6, you're welcome to join the Iowa Youth Writing Project for a new Friday Writing Club at the Iowa City Public Library! In this fun hour of creative writing games, you'll invent whimsical stories and discover surprising ways to play with your words. Come ready to explore new worlds through writing! No previous creative writing experience is necessary. National Day on Writing with the IYWP! Join the IYWP to celebrate the 10th Anniversary of the National Day on Writing! You'll find an exciting array of prompts to inspire you to dream up new characters and imaginative worlds. Grades 4-6 are invited to join IYWP interns and staff for this blow out writing workshop and party all rolled into one! Today in the US, who is considered an insider and who an outsider? What does it mean to be an American? If you're a teen in grade 8-12 who cares about what's happening with immigration in our country, join the Iowa Youth Writing Project for this workshop on immigration and identity. Expect snacks, a series of thought-provoking writing prompts, and a Q & A with a talented panel of community leaders to help us rethink immigration in the US. Instructor: A lineup of exciting local comics artists! Are you a passionate comics artist? Do you want to meet and work with other dedicated comics artists? Then this workshop is for you. In these two sessions, you’ll work closely with professional artists to make and print 2-3 of your own 12-page mini-comics. Along the way, as you experiment with craft elements like story layout, character development, and cover design, you’ll also gain experience in pricing and promoting your work. Sessions will culminate in your attendance at ICE CREAM, the fourth annual Iowa City Expo for Comics & Real Eclectic Alternative Media, on Saturday, April 6, where you’ll display and sell your completed comics!